Despite being an item a wear on a very regular basis, I find jeans a bit of a nightmare. Finding a fit that works and that can accommodate my ever changing shape and weight seems to be a bit of a chore and a needle-in-a-haystack type job. In my despair last week, I picked up these Primark skinny jeans, in a bid to try something new with colour but also a last resort as my favourite Topshop Martha jeans are falling down to the point of obscenity. Turns out it was a good move. 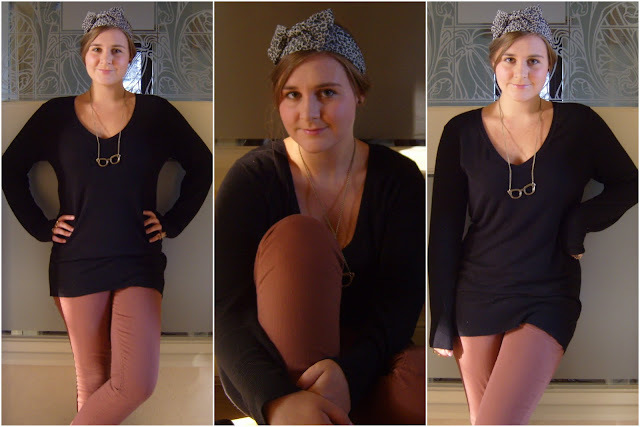 Not only am I in love with the colour for autumn, it's really nice to wear skinny jeans again. They're something that I've shuffled away from and left alone for a while, but I'm firmly back into these. They also have the added benefit of staying put without me having to hoist them up every 30 seconds- definite bonus after the last few months! A bottom half shot for you, to see them in all their glory. Also thought I'd have a bit of a play with this headband. I won it from the lovely Fashion Bandit last year, but it has since sat in my box of hair "things" with me too scared to have a go with it. Not sure it's quite me, but it was fun to try. any thoughts? There are still some very pretty shoes up for grabs on my SALE section, as well as some dresses from Spanish brands unavailable in the UK. Go check it out. I have never tried Primark jeans but a few people have said about them so I think I'm gonna have to try them now, especially as you look so gorge! I haven't had much success with Primark jeans but I'll be giving them a go after this rave.